(Text automatically translated) Large living room, fireplace, kitchen, nice terrace 100 m2 south facing kitchen, beautiful view overlooking the valley, ideal for family reunions, large inglenook fireplace, firewood available, large lounge, barbecue, garden furniture , deckchairs. Environment very green and sauvage.Calme. 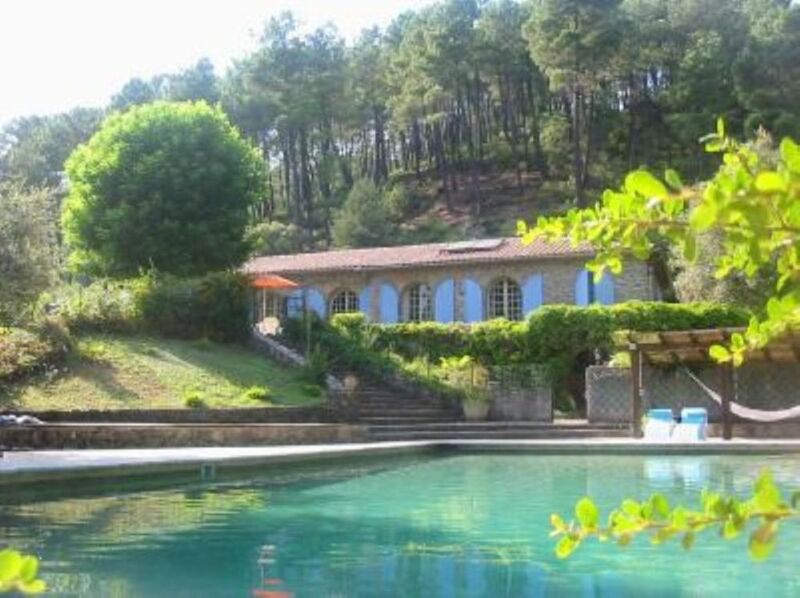 Charme.Terrain 13 hectares. We had a wonderful week here as a large family party. The terrace and outdoor eating area is spacious with an amazing view that you will never tire of. The kitchen is big, and very well equipped for a rental property. The pool is huge, and you can do proper lengths, but you can also go down to the river which is very close by and lovely for a dip. St Jean du Gard has several weekly markets, a zip wire place for kids (and adults! ), steam train, canyoning and there are endless beautiful walks in the area. A good choice for an active holiday or just reading a book by the pool. We were a large group of 14, so some of the bedrooms were not as nice as others, but this was outweighed for us by the positives. Would definitely go back. This is a tranquil home , accommodated a family of seven very comfortably, would highly recommended it ! "The house and surounding is extremely nice, we liked it very much! We recomend it for people looking for relaxing holiday." "We stayed for one week in May and had a wonderful time. Nice owners who were very pleasant in dealing with our booking and speak good English. Family house with everything you could possible need. Situated in a very beautiful part of france - great for walking and cycling. St Jean le gard is big enough to meet most needs, shopping , bars , restuarant. The pool is large and deep - but situated slightly away from the house and terrace - so with care should be sitable for those with small children." Wir haben Anfang Oktober einen wunderschönen Familienurlaub in dem Ferienhaus verbracht. Es ist sehr geschmackvoll und gemütlich eingerichtet. Die Küche ist geräumig und mit allem ausgestattet, was das Herz begehrt. Rund um das Haus sind überall Sitzplätze, so dass wir immer in der Sonne essen konnten. Am Pool kann man prima entspannen- auf den Liegestühlen, in der Hängematte oder auf dem Holzdeck. Wir konnten sogar noch täglich im Pool schwimmen. Die Matrazen der Betten sind sehr bequem, wir haben alle ausgesprochen gut geschlafen. Dass die Bäder und die Einrichtung teilweise schon älter ist störte uns gar nicht. Im Gegenteil, uns gefiel das besonders, das Haus hat dadurch noch mehr Charme. Die Lage des Hauses ist traumhaft. Ruhig und im Grünen. Um das Haus herum sind schöne Beete mit Hortensien, viel Rosmarin und Lavendel. Abends konnten wir unter sternklarem Himmel draußen sitzen. Vor dem Haus ist ein praktischer, gemauerter Grill und auf beiden Seiten des Hauses gibt es bunte Lichterketten für eine gemütliche Beleuchtung. Wir haben unseren Aufenthalt sehr genossen und kommen gerne einmal wieder. Vielen Dank für alles! Bonne semaine sous le soleil des Cévennes - au calme et dans la verdure. La maison est très agréable, pleine de charme, spacieuse et bien équipée. La piscine est immense et bien sécurisée. Nombreuses possibilités de visites et les commerces ne sont pas loin. (Text automatically translated) TRAIN: The nearest railway station is ales, 35km (45 min). But there are also 70 km, Nimes station (1h15 drive) and 80km, Gare de Montpellier (1:30). But there are direct connections from Nimes Train Station to St. Jean du Gard bus (information at the Tourist Office of Saint-Jean du Gard which is also a wealth of information for all sports and activities sîtes visit. accessible by car on request Plan.